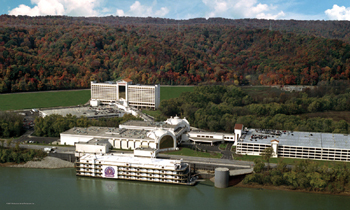 Horseshoe Casino Hotel is just 20 minutes from downtown Louisville, Kentucky. Experience easy-to-win slots and the biggest jackpots at Horseshoe. Pull up a seat at your choice of over 2,100 traditional slots, or progressives and set your sights on a jackpot! You will find all your favorite slots in a range of denominations. The Spread Buffet - Casual Buffet - Reinventing dining at Horseshoe Southern Indiana. Jack Binion's Steak House - Upscale Steakhouse - Indulge without apology at Jack Binion's Steak House at Horseshoe Southern Indiana, which sets the standard for dining excellence with its luxurious decor and elaborate dining areas. Corner Cafe - Quick Bites American - Corner Cafe, located in the Pavilion! With options like delicious sandwiches, fresh salads, and gourmet desserts, Corner Cafe offers the perfect selection to tide you over. Pearl - Casual Asian Fusion - Pearl Asian Restaurant offers authentic Vietnamese and Chinese cuisine in an elegant contemporary atmosphere to Horseshoe Southern Indiana diners. Legends - Casual American - Legends is trendy casual dining Horseshoe Southern Indiana restaurant serving traditional American favorites in a fun and festive atmosphere. Aroma Cafe & Bar - Quick Bites Cafe/Variety - The Aroma Cafe & Bar serves a full menu including appetizers, grab-and-go sandwiches, pizza, steak, seafood, mouthwatering desserts and your favorite wines and spirits. Graeter's Ice Cream - Quick Bites American - Now open at Horseshoe Southern Indiana! Serving Louisville and Southern Indiana with handmade, hand-packed, hometown ice cream. JB's Cafe - Casual American - JB's Cafe at Horseshoe Southern Indiana is a restaurant open 24 hours a day, serving classic American favorites like the legendary 9-ounce Binion Burger.